The Ronin Motorworks 47 have been Internet darlings since they were announced several years ago. 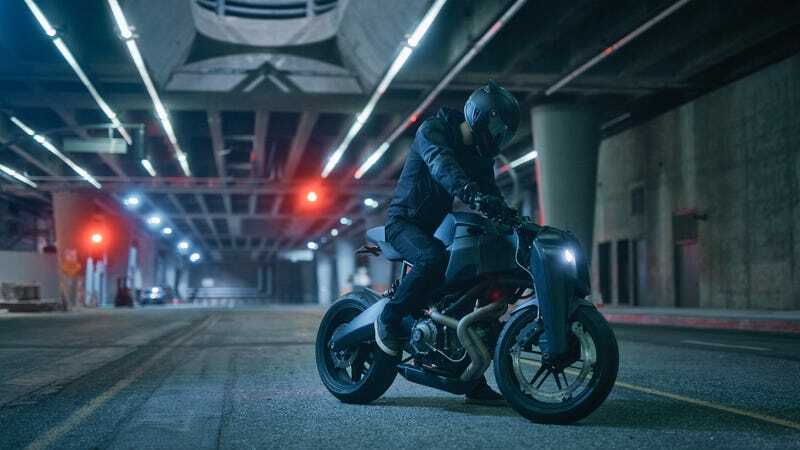 When you take a Buell 1125 — an awesome motorcycle to start with — then add more performance and the looks of a high-tech street bike from from a dark vision of the future, this is what you get. Here’s how they build it. I got a chance to meet the Magpul Ronin guys, who make high quality firearm accessories for their day jobs, at The One Show in Portland this spring and they were so enamored with my winning personality that they agreed to bring a bike to Los Angeles and let me ride it. Then I begged one of LA’s most talented photographers, Dean Bradshaw, to come and shoot some pics of it while I asked the Ronin’s Mike Mayberry questions about how this beautiful machine came to be. No, I have no idea how I talk people into this stuff either. Sean MacDonald: Either you guys are massive Keanu Reeves fans or there’s some other explanation - what’s with the name Ronin? Mike Mayberry: I hear Keanu is an awesome guy, but his movie wasn’t out in 2009 so... sorry Keanu, but you don’t get credit for this one. The Ronin story came to us while searching for a name for the project that had as much meaning to us as the design itself. We have an affinity for Japanese culture and the name stood out because we saw a ton of parallels between the story and the Buell legacy and the bikes left behind. In Feudal Japan, a samurai warrior who had lost his master – usually through death - was called a Ronin. The most famous being the true story of the revenge of the 47 Ronin. This story was later popularized in Japanese culture as example of the loyalty, sacrifice, persistence, and honor that people should preserve in their daily lives. For us it was also emblematic of the Buell motorcycle faithfully living on even after the fall of the Buell brand. It didn’t take long after we chose the name to realize we would have to build 47 bikes… and so it began. SM: How did you guys get all 47 bikes? Did you get them from HD corporate (who owned Buell at the time)? I’m imagining some warehouse in some hidden facility with rows upon rows of beautifully untouched 1125s. MM: Bikes were actually purchased from numerous dealers in the Midwest and California. Some dealers couldn’t get them off their floors quick enough (HD required all dealers to stock Buell whether they wanted to or not) and some bikes required negotiation. All bikes were showroom new and were drained, prepped and put into storage upon arrival at our shop. A total of 50 were purchased. SM: Walk me through the bike - what did you guys do to the 1125 to make it your own? What changes are just aesthetic versus for performance and why did you go that route? MM: We kept what we loved about the bike - which is essentially the perimeter fuel frame, swingarm, and engine. These were the parts that initially grabbed us when we first saw the bike prior to release. We had a linkage fork designed for the Buell XB, but had never built it, so naturally this bike seemed the perfect fit. From there, we then set about redesigning the rest of the bike to complete the vision. This included the subframe and airbox, with the goal being to celebrate the fuel-in-frame design rather than cover it. We also designed a new exhaust system, new intake manifold, cooling system, brake levers, handlebars, instruments and controls. We went to great lengths to showcase the engine, which is absolutely beautiful. Doing this required the removal of all plastic covers and trim, the design of a new exhaust system, and relocation and redesign of the entire electrical harness (the stock harness was removed and rebuilt into three totally new harnesses). The original side radiators were removed and a new high-density core was placed at the front of the bike. This is by far the most interesting and most controversial part of the bike – but actually has little effect on the handling as some people assume. The rears sets were also totally redesigned and are now an extension of the engine cases – housing the battery and exhaust mounts, and further celebrating the lines of that Rotax engine. The 1125 engine in its stock form is a force to be appreciated and, as such, we didn’t see the need to modify it much. It has plenty of grunt at any RPM and delivers power in a smooth and linear manner that makes it both enjoyable and exhilarating to ride. We didn’t want or feel the need to screw with this amazing power, so instead we focused on addressing the engine’s shortcomings. In particular we spent a significant amount of time solving the stator burnout issues and cooling problems, as well as improved fuel mapping for better low-end performance and engine temp management. We also went through the top end of every engine to make sure valve clearances are correct as most bikes were tight from the factory. SM: What was the hardest engineering feat to pull off? MM: By far the most challenging part of the project was taking the prototype fork and redesigning it for production. The front fork isn’t overly complex, but there is a lot of stuff packed in there. It’s also a critically stressed element of the bike and must be properly engineered for performance, safety and manufacturability. The prototype forks on the first bike were computer modeled and then built using rapid prototype casting methods. This is done by 3D printing full-size wax patterns of the designs and then using the lost-wax investment casting process to yield finished parts. This process is also very expensive, so for a production motorcycle we had to look to more conventional casting methods. This meant we had to redesign all of the parts so that they could be pulled from traditional molds. In addition, we also had to integrate the two stacked headlights into the right fork leg, and the coolant system overflow into the left without adversely affecting the structural integrity of the fork or moving any of its critical pivot locations. We spent many months and worked through countless design revisions and variations before settling on the final form. We also ran countless rounds of FEA on all parts to ensure the forks were optimized for weight and rigidity while also being safe and reliable… and all of this had to happen in a way that didn’t lose the distinctive appearance and clear visual lineage to the first prototype. We didn’t want this to be like so many concept cars that have lost their appeal and spirit – or their functionality - by the time they reach production. SM: Why the girder front? MM: The four-bar linkage or ‘girder’ fork allows a designer to do some things that you simply can’t do with telescopic forks. Like double A-arms on a performance car, the linkage design lets you tailor all aspects of the wheel’s kinematics. You can add or reduce dive under braking by changing the path that the wheel follows – a more vertical path is more neutral to braking forces and will resist diving, and a more lateral path will react more to braking – you can even create rising or falling rate combinations of the two. You can also control the rate of the spring and damping through the linkage and design in a rising rate for the spring (think monoshock rear suspension on a dirt bike vs two shocks connected near the rear axle). In our case we intentionally designed a 3:1 ratio with rising rate for the front shock – this means the wheel moves three times the distance of the shock shaft. So for 6” inches of wheel travel we need only a shock and spring with 2” travel. This means a more compact spring, less oil and a significant reduction in size a weight. The 3:1 ratio and small single shock shaft also significantly reduces seal ‘stiction’ so the fork is amazingly compliant and plush (again, think about the dirt bike comparison). If that weren’t reason enough, it also frees us up to design the fork leg in a shape other than tubular and straight – we can connect the dots between pivot points and front axle however we like. We felt this was really important as it allowed us to add visual mass (not actual mass) to the front of the bike to complement the visually massive fuel frame and swingarm – both of which we love. SM: Your Tech Specs say your front end is as light as the typical telescopic front, how’d you pull that off after moving the radiator to the forks? Does the flexing of the hoses as you turn the bars cause any problems or require the hoses to be replaced more? MM: OEM Fork legs, triple clamps and steerer altogether weigh in at around 25lbs. We managed to stay within a few pounds of that weight because of the single spring and damper, and highly optimized fork leg design with internal rib structures where needed to counter braking forces and suspension flex. The two coolant hoses run right underneath the steering bearings and see very little flexure. This location also minimizes the amount of resistance felt in the handlebars while riding. So basically they will last as long as any other hose and you don’t even know they’re there. SM: Buells were known to have a lot of issues running too hot, did you guys address this? MM: We did a few things - we opened up the engine compartment to allow better airflow around the engine and fuel frame, we remapped the engine and richened the idle and low end which typically are overly lean on modern bikes because of CARB requirements. We removed the radiators from the sides and designed a new frontal radiator, and worked with Ricks Motorsports Electric to solve the stator heating issue. We did this by creating a totally new stator (with optimized windings) and adding oil passages in the flywheel to allow for better oil circulation. SM: We Lanesplitters are pretty big fans of geeky tech, tell me about some of the tech you included on the bike. MM: Well… in additional to all of the above, we chose to use Motogadget’s new M-unit system in lieu of the OEM harness, fusebox and relays. The M-unit is pretty slick – it’s a solid-state replacement for almost every fuse and mechanical relay on a bike, including turn signals, starter relay, high-low beam and ignition control. It’s so compact that we were able to integrate it into the small tail unit on the bike, and allow for easy access. We also utilize Motogadget’s RFID ignition lock system, which means there is no key and mechanical tumbler on the bike, only a proximity sensor and batteryless key fob which we make. Touch the fob to the top of the airbox cover and the bike comes to life. SM: You bought both 1125Rs and 1125CRs. How are those different and how are you using them differently? Or are people just getting Ronins that ride differently? MM: The only significant difference between the two is the final drive ratio. The R is geared taller than the CR and is better suited for highway and track use whereas the CR is more of an urban fighter. The difference is subtle but noticeable. Each build series we produce has a mix of both R and CR ratios so that the customer has the option to choose. SM: So you’ve done silver and black, and have black on black planned? What’s next in the aesthetics department? Just different paint? MM: We are building bikes in batches of decreasing quantity. We have built 12 Silver and 10 Black – most of which are sold. The next batch will be eight silver/white/brushed bikes, then six vintage race bikes. After that are four bikes done in four variations of Multicam pattern. We worked with Crye Precision in NYC on these bikes and three of the four will be sold to them – most likely to be auctioned for Veteran charities. We will also do two bikes in bare metal or ‘raw’ finish. After that we are left with the last five bikes of the 47… number 01 was built as a race bike to compete in the 2015 Pikes Peak hill climb (this bike is also sold) and is the only bike in the 47 to be built around the newer 1190 engine. The paint on this bike is based on one of our favorite vintage Japanese cartoons – Mospeada (ed. note: the third chapter in the animated saga Americans know as Robotech). Before anyone in the United States had ever heard of ‘Transformers’, there was Mospeada, in particular there was the amazing Cyclone Motorcycle which would transform into a wearable backpack. Ours doesn’t transform but it is blindingly fast. SM: I’m sure you customer base is pretty scattered, but if you had to describe your customer so far - who are they and what do they all have in common? MM: Our customers are enthusiasts, riders, collectors and gear heads and they all seem to have a deep appreciation for quality and craft. One of our recent sales was to a gentleman from Switzerland who rather than have us ship his bike to him, chose to fly out to our shop, hang with us for a day and then ride his bike from Denver to San Diego before shipping it back home. He has since told us he plans on buying a second Ronin as soon as he stops smiling from his first. It’s customers like him that make the whole project and all of its sacrifices worthwhile, and reminds us why we decided to do this in the first place… to build something bigger than us, put it out into the world, and see where it goes in time. Check back in shortly for an article about the when the Ronin boys went temporarily insane and let me ride the thing.